Andhra Pradesh LAWCET Notification 2019 available now from www.sche.ap.gov.in/ & www.manabadi.co.in. Flash.. Flash...: AP LAWCET NOTIFICATION for the year 2019 has RELEASED. Sri Krishnadevaraya University is conducting AP LAWCET and PGLAWCET on the behalf of APSCHE, Andhra Pradesh Law Common Entrance Test is commonly known as APLAWCET is conducting for for admission into regular LLB course ( 3 years and 5 Years) & LLM. Course (2 years) for the academic year 2019-19. The examination is held once in a year and is done on state level basis. The students who desire to chose a stream of Law can adopt for this examination. 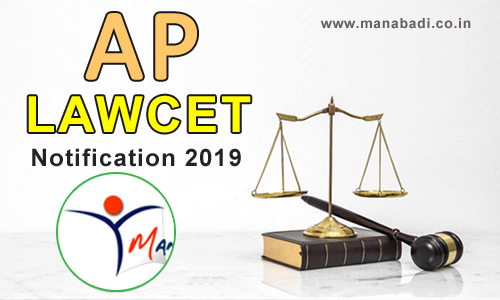 This article helps you to know more about AP LAWCET 2019 Notification, LAWCET exam dates, eligibility to write LAWCET Exam, AP LAWCET 2019 syllabus and Andhra Pradesh LAWCET application form. Candidates must have passed bachelor degree or equivalent in any discipline from a recognized university. Candidates must have passed 12th or equivalent exam from any recognized education board. 4. Candidates should be the citizens of India. For SC/ST Category: 40% marks. The question paper will contain 120 objective types of questions and the duration to write the APLAWCET -2019 exams is 90 mins and the question paper will be English and Telugu language. There are no negative marks in AP LAWCET. The AP LAWCET -2019 Exam conducting in 10 different exam centres in Andhra Pradesh. Candidates may choose the exam center while filling the application form. Once the exam centre is allotted, the changes will not be done under any circumstances. The regional centres where the AP LAWCET -2019 exam is carried out are as follows. Application form will be accepted through online mode only. Online application will start from 9th march 2019. The candidates who are appearing for final degree examinations of 2019 are also eligible to appear for entrance examination. Candidates should have secured 50% marks either in the Bachelors Degree i.e. B.A./B.Sc/B.Com (Home Science)/BCA/BBM and/or in the Masters Degree or any other qualification equivalent thereto. However the candidates belonging to all other reserved categories should have secured 40% marks in the qualifying examination. The qualifying mark in the Entrance Test for all candiadates (except SC/ST) is 37 out of total marks (i.e 25%). For the candidates belonging to SC/ST communities there will be no qualifying marks for ranking. The candidates should have completed 19 years of age on 01-03-2019. Degree Marks SC & ST: 40%. Email Id is mandatory to apply for the AP LAWCET 2019. Visit Offcial site or visit this page. Manabadi.co.in we will redirect you for LAWCET Applying page. Regional Center to which candidate wishes to appear for AP LAWCET-2019 examination. The candidate has to submit the "FILLED IN ONLINE LAWCET 2019 APPLICATION FORM" to the invigilator in the Examination Hall on the day of the APLAWCET-2019 exam. Also, affix a recent color photograph (3.5cms x 3.5cms) in the box provided (Bottom / Left side) on the "FILLED IN ONLINE EAMCET 2019 APPLICATION FORM" and get it attested by a Gazetted Officer / Principal of the college where studied. The candidate belonging to SC / ST category has to submit the attested "CASTE CERTIFICATE" along with the FILLED IN ONLINE APPLICATION FORM" to the Invigilator on day of the APLAWCET-2019 exam in the Examination Hall, in case, the Application number of his/her Caste Certificate is not provided at the time of the Online submission of the Application. The candidate does not have option of choosing specific date / session to appear for the AP LAWCET-2019 entrance examination. This information is known to him / her only after downloading Hall Ticket. For any reason if the candidate fails to appear in the given slot, he / she is treated as absent. The AP LAWCET 2019 language will be Telugu and English only. The qualifying percentage of marks for the AP LAWCET-2019 is 37 maximum marks considered for ranking. However, for candidates belonging to Scheduled Caste and Scheduled Tribe, no minimum qualifying mark is prescribed. But their admission will be limited to the extent of seats reserved for such categories (vide G.O.Ms. No. 179, LEN&TE, dated 16.06.1986). How to Prepare for AP LAWCET Exam? Go through all the previous examination paper of AP LAWCET 2017, 2016, 2015 etc. You need to keep the admit card carefully and keep at least two copies of it. You can get the copy of admit card from official website of AP LAWCET 2019. You need to submit the birth date and registration number. After filling all these details, you need to press the submit button shared below boxes, now after processing you will see your admit card, Just take the print out of it. On admission date, the candidates need's to bring additional documents with admit card, Attested copy, photocopy and filled the application form. For counseling, the students need to keep their online Application Form until the end of the admission process. While verification of the documents, they need to provide other documents and admit card to the desired authorities. The official website either the counseling portal will be providing the Information Booklet for AP LAWCET 2019 counseling. Plz tell conduct.. Ecet 3 rd Counciling.. My future is in ur hands sir.. PremsetPmy clg was very bad . Amd feez was heavy also sir..plz give me one chance . I change my college.. Plz tell me.. 3 rdrcounckimgrd is there or not?? ?